Hello. My name is Tammie and I am addicted to fuzzbutts. I'm not quite sure what my ferrets colors were either, but I think Picaro was silver, Bribon was Dark with mits, a bib and a milk mouth, Navasca was blue roan, and Ozzie was Marked white or perhaps silver. My favorite colors were the girls, I loved Nava's blue, very pretty. Ozzie's color was linked with health problems (wardy) so it makes me sad to think about him and what he had to go through (cancer, anemia, fatigue). 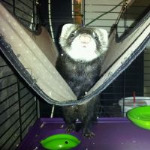 However, he was still a pretty ferret, I just will not be getting another like him unless its a rescue.